A XAVL teaser image shows the concept has bold and aggressive lines. 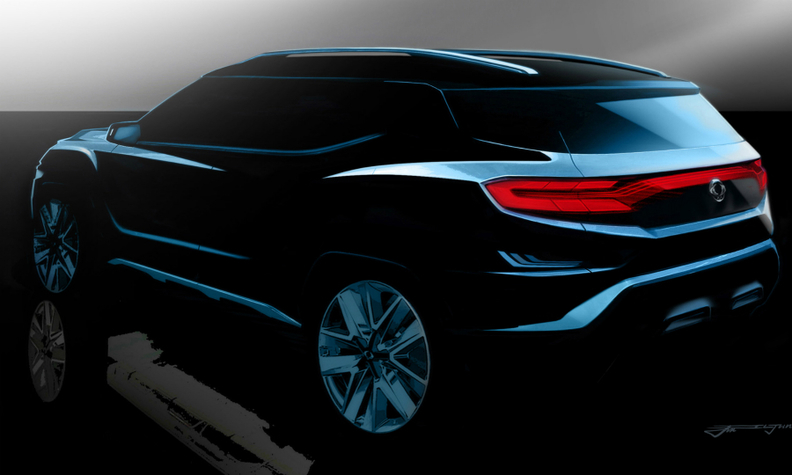 SsangYong will reveal an SUV concept at the Geneva show that points to a future rival to the Skoda Kodiaq. The Korean automaker describes its XAVL concept as blending the tough looks of an SUV with the practicality of a minivan. The concept looks ahead to a seven-seat SUV that will be launched in Europe in 2020, a source close to the company said. The new car will sit above the Korando compact SUV due in 2019 and below the Rexton large SUV launching later this year. The XAVL concept is powered by either gasoline or diesel engines and comes fitted with a pedestrian detection safety system as well as connected-car technology, SsangYong said in a statement. SsangYong sold 19,705 cars in Europe last year, according to market analysts JATO Dynamics, up 35 percent on the year before. The company’s best-seller is the Tivoli subcompact SUV, which accounted for half its sales. SsangYong's parent, Mahindra and Mahindra, is considering boosting investment in the brand to increase SsangYong's annual global vehicle sales to 300,000 units by 2021. IHS Markit forecasts sales will grow by 9.7 percent to 166,326 this year, up from an estimated 151,679 in 2016. IHS expects sales to cross 200,000 units by 2020.